This build is dedicated to my firstborn son, Chris, who passed away on Feb 18, 2017 from an accidental overdose of heroin/fentanyl. I wont spend a lot of time here detailing what Chris meant to me other than to say he is my son. My firstborn, my namesake, and a kindred spirit in many ways. He’s a part of me and I could not love him more. He changed me in a very fundamental way the day he came into this world, and he did so again on the day he left. A significant part of me died with him that day, but I hope that part will be reborn on the day I leave this world to join him. I miss him. I miss his face, his charm, his wit, his intelligence, and the twinkle in his eye. I even miss some of his more exasperating qualities because all those things together were uniquely Chris. Chris is gone from the physical world, the world in which the rest of us must continue to exist, and now 3 months later (at the time of writing) I’m still struggling to find a way to live with that. I have to conclude at this point that it will never be OK, nor will I ever be whole again. I’m moved by the deep and abiding love I feel for him to create some kind of physical memorial. Something that I can touch and see and that connects me with Chris through sight and sound and spirit. Chris had very recently found a true passion for playing guitar and making music, so a special guitar seems appropriate and right. I was already working on a custom build as a gift for him but he died before I completed it. That guitar sits unfinished in my studio and there it will remain unless and until my other son Jake, Chris’s younger brother, claims it for his own. He is the only other person on earth to whom I would ever consider giving it. The Phoenix is for me. As to why I’m calling it “The Phoenix”, that should become apparent pretty quickly. In addition to being dedicated to Chris, this build will also be a tribute to him and will feature a number of custom designed shell inlays that represent tattoo’s that he had that were special to him and to me. The largest of these is a phoenix taking flight on the back of the body and a large Aires logo also on the back of the body. I was there with him on the occasions he got those two tattoos. In fact, I paid for them. 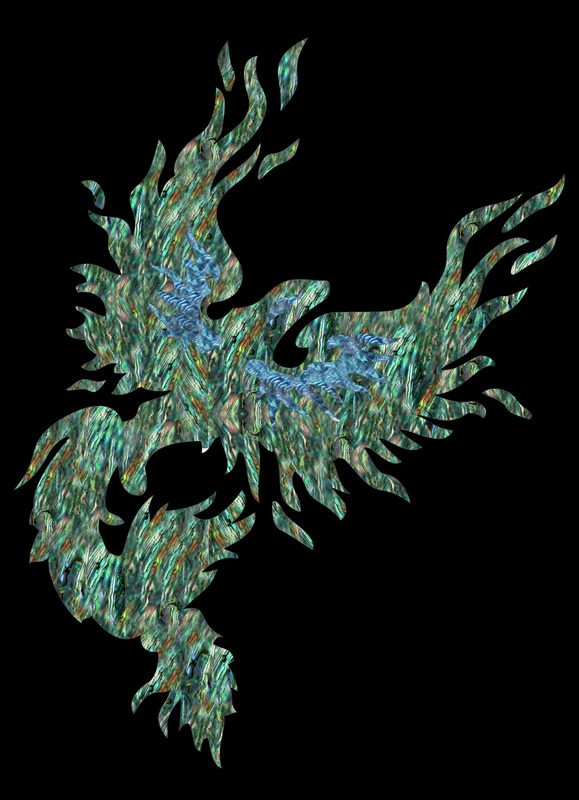 The phoenix was on his chest, and the Aires symbol on his shoulder. 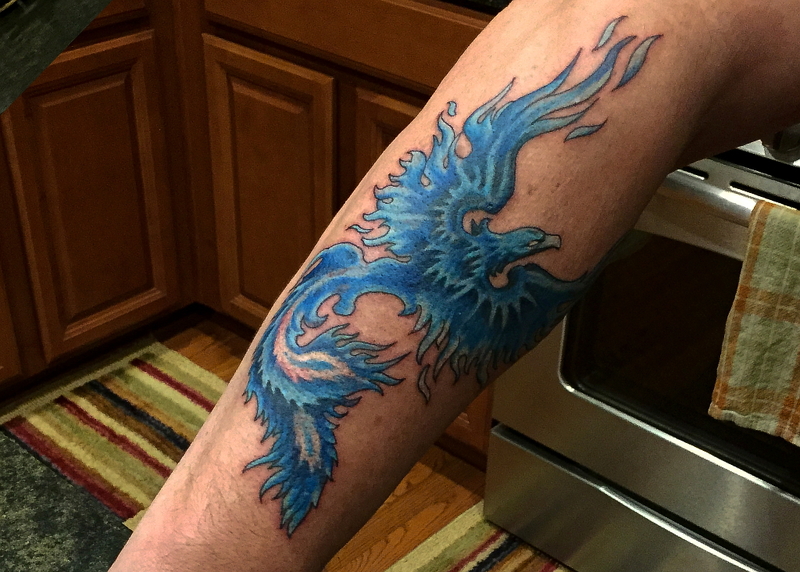 I also have a tattoo of a Phoenix on my own chest that predates Chris’s by many years and was one of Chris’s motives for choosing it for himself, and I have recently gotten Chris’s phoenix tattoo on my own arm in memory of my son. As lowbrow as it might sound, I love tattoos. I have a lot of tattoo’s now, and I will almost certainly get more. Chris and his younger brother Jake both share this love. These two in particular represent special memories of some of the good times that we shared. I cherish them as I cherish him. 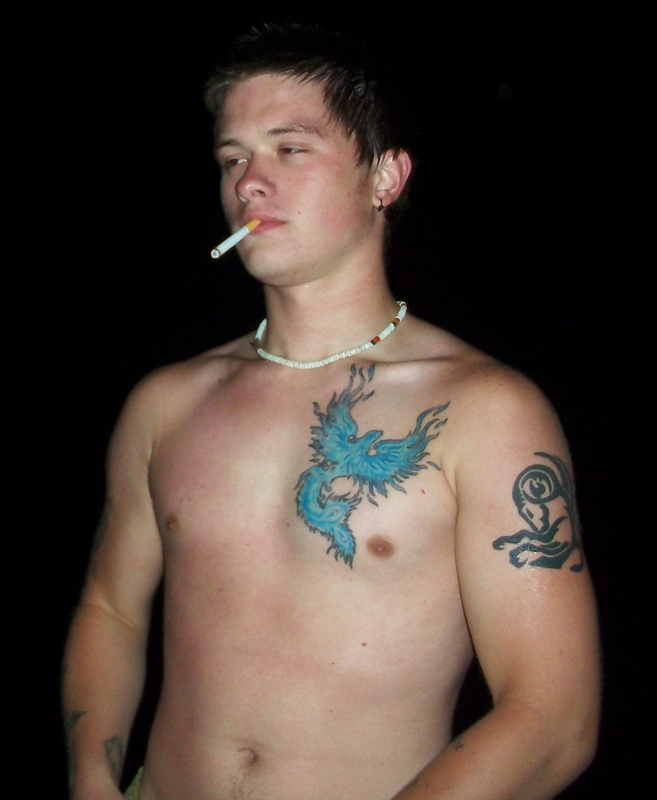 Both tattoos are visible in the above photo of Chris. There will also be a couple smaller inlays. A smaller Phoenix on the fretboard as a 12th fret inlay, and a smaller, more abstract Aires symbol on the headstock. The main two inlays will be quite accurate in both size and shape when compared to the actual tattoos, but wont be accurate representations of the colors. I’m taking some liberties in that area simply because shell is only available in limited colors. Trying to re-create the colors would require using different materials and I like natural shell. Abalone, mother-of-pearl, blue paua. Their pearlescence, their depth, the way the colors shift and change depending on the light and viewing angle. Nothing artificial compares with the way these look, not even things like “Abalam” which is specifically designed to mimic this look in different, more uniform colors. So, the plan. 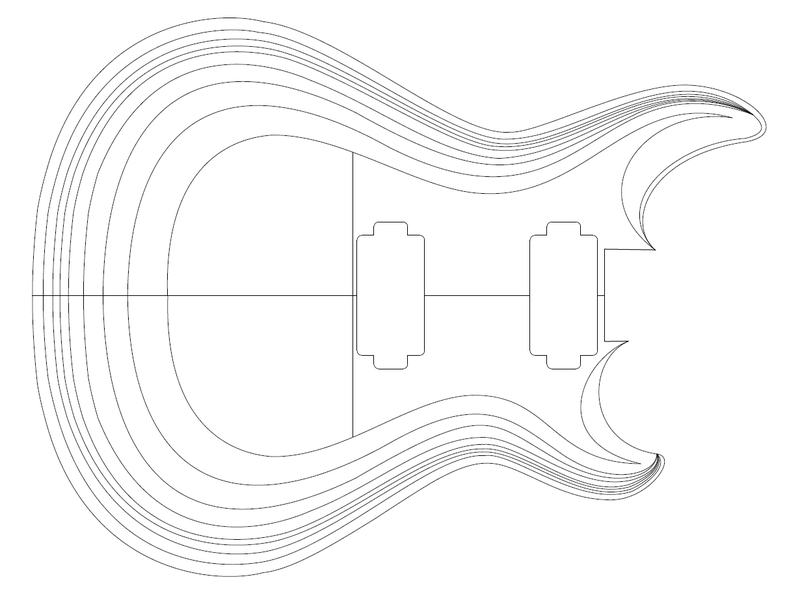 Below is my guitar design as well as design drawings for the inlays. 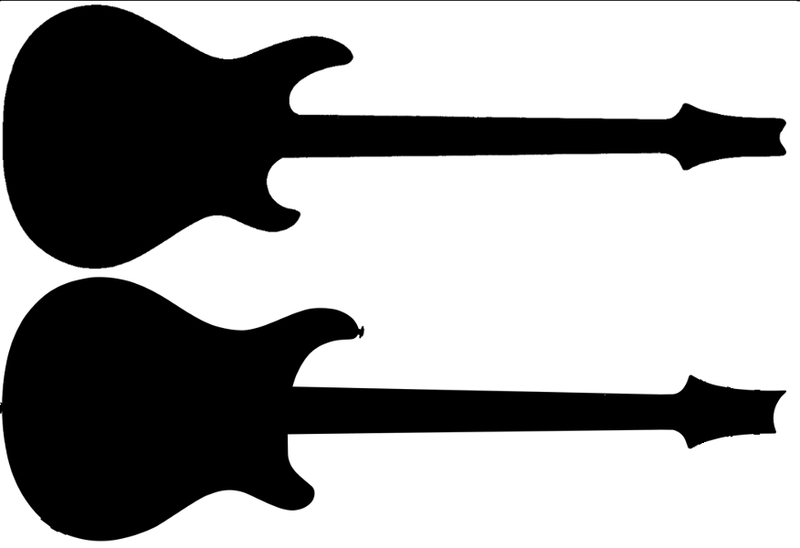 I drew them up in CAD software and sent the guitar body and neck designs to a friend with CNC machine to cut them out for me. The curved lines on the body in the design drawing below are not pin stripes or anything. They represent a topographical map of the carves and contours. You’ll see when I get to that part. The body shape/model here is the final iteration of my “24 Magnum” design. This is an original design that has been “maturing” since my first 24 Magnum build from 3 years ago. Previous versions were prototypes, each changing slightly until arriving at this, the 4th and final version. 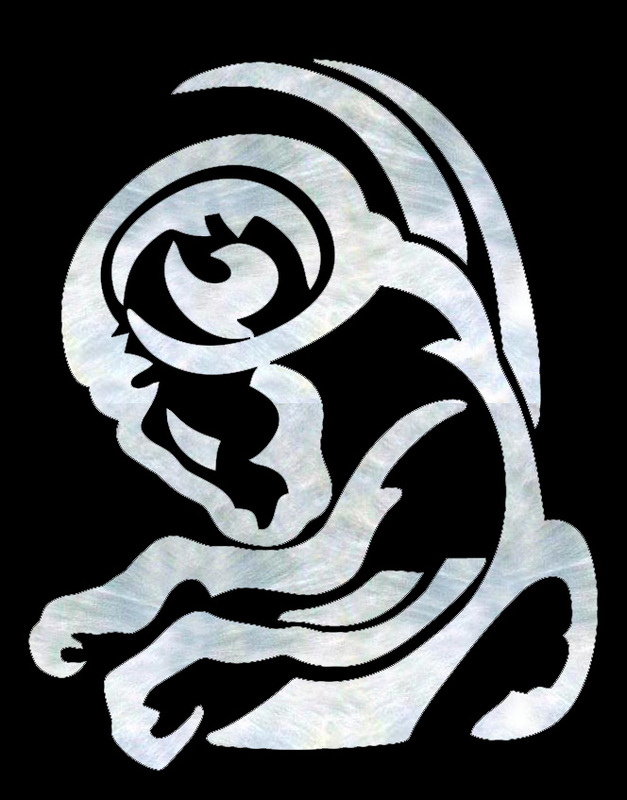 Below are the designs for the larger “tattoo” inlays, which I took from the photo’s of Chris, both shown in the material that the inlays will be. 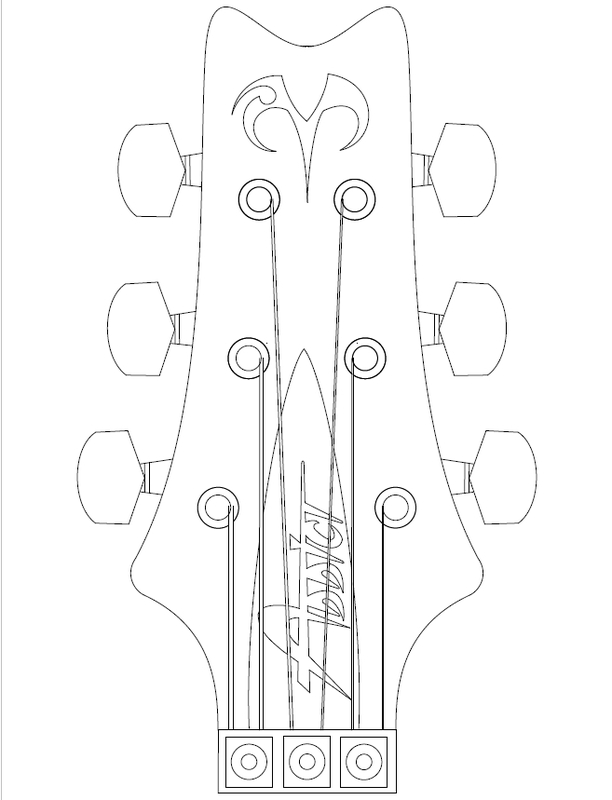 The last inlay will be on the headstock and will be a more simplified Aries symbol in white MOP. Also on the headstock will be my standard Addict logo on the truss rod cover in white mother-of-pearl. Getting back to the model itself, the body and headstock shapes and top carve makes up for what was lacking in all my previous 24 Magnum builds from a few years ago. Having lived with them for a couple years, and having played them, and most of all looked at them, I made some more modifications. Mostly in the body shape and top carve, but also in control layout, and a couple minor differences in approaches to construction, and finally changes to my finishing methods. The design is intended to appeal to the tastes of people that like PRS guitars. Its clearly not a PRS. Nobody that knows anything about guitars would ever confuse the 24 Magnum with a PRS even with just a quick glance from across the room. It does borrow a design element (modified to my taste) from PRS, though, and thats the top carve style. It also has kind of the same “vibe” as a PRS. Beautiful finishes, attention to detail, etc. The notion that an instrument can be functionally excellent, tonally superb, unique, and visually beautiful all at the same time. That vibe. Thats what I’m shooting for anyway. PRS guitars didnt actually invent this vibe/notion, but in the electric guitar world that’s certainly the vibe they built their reputation on. Anyway, a quick comparison of body shapes dispels any notion this is some kind of PRS clone. Addict on top, PRS on bottom. I want to take a minute here to give special recognition to Paul Eckert at Sweetwater. Paul has been my sales rep at Sweetwater for about 5 or 6 years now. I’ve made many purchases of recording equipment for my studio, instruments, and guitar parts over that time and he always gives first rates service. Over the course of our association we’ve also become friends. I always share pics and updates on my builds, we’ve talked about all manner of things, musical interests, our various recording projects, and most recently the birth of his own son who is now 7 months old (at the time of writing). I cant adequately express my gratitude for his generosity of spirit. All I can say is thank you, Paul. 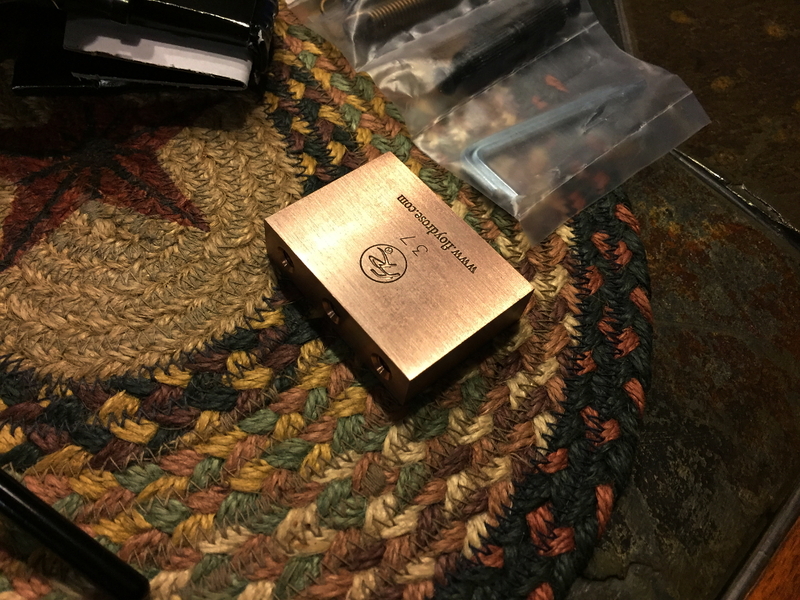 Solid Tungsten sustain block for the bridge. 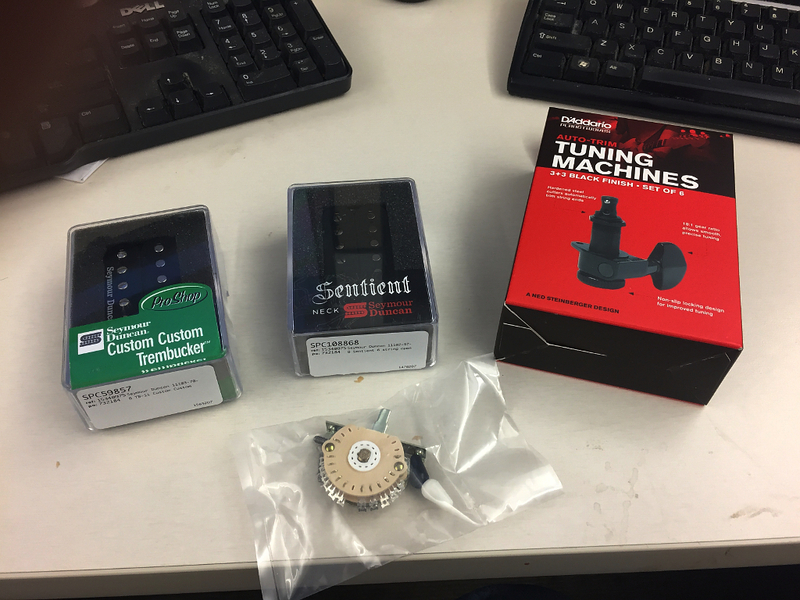 These are the parts I mentioned above that were donated by Paul Eckert at Sweetwater. 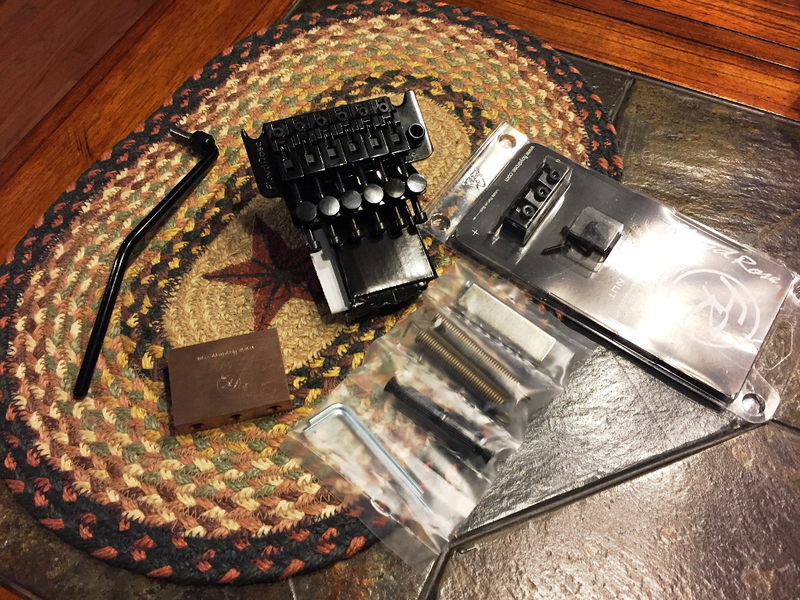 More progress on the double-Strat build.